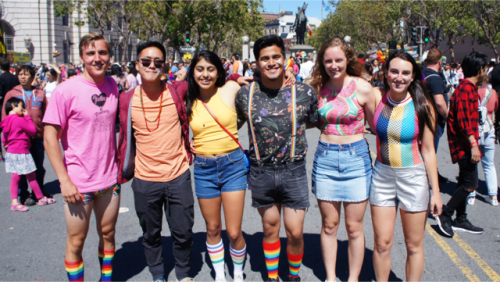 I started my DukeEngage program ecstatic to spend pride month in San Francisco. My co-workers have me to thank for constant reminders to plan their Pride outfits weeks in advance, and I had been meticulously sketching out ideas of what to wear. This would be my first pride event ever so I was hoping to go ALL out. I figured being in the supposed mecca of queer people all around, I wouldn’t have to think twice of being judged for how I present myself, but this wasn’t the case. A shocking 40% of homeless youth are reported to be members of the LGBTQ+ community. For this reason when working with this homeless population, we strive to be inclusive to all its members. Larkin Street Youth Services hosts workshops on queer inclusivity and community dialogue between staff and clients about Pride. The efforts taken by the organization to quell any hesitations or inexperience interacting with the queer youth was something that I found encouraging as a queer person of color (QPOC). Aside from my exposure to the LGBTQ+ community at work, we toured the Castro and got a brief historic overview of the riots that led to our celebration of Pride today. I traveled with a friend to watch the Queer Women of Color Film Festival and met so many lovely individuals. Heck, there were even pride flags hanging all over San Francisco! This was a perfect place where I didn’t need to hide. What other signs did I need? This play was gay-okay! 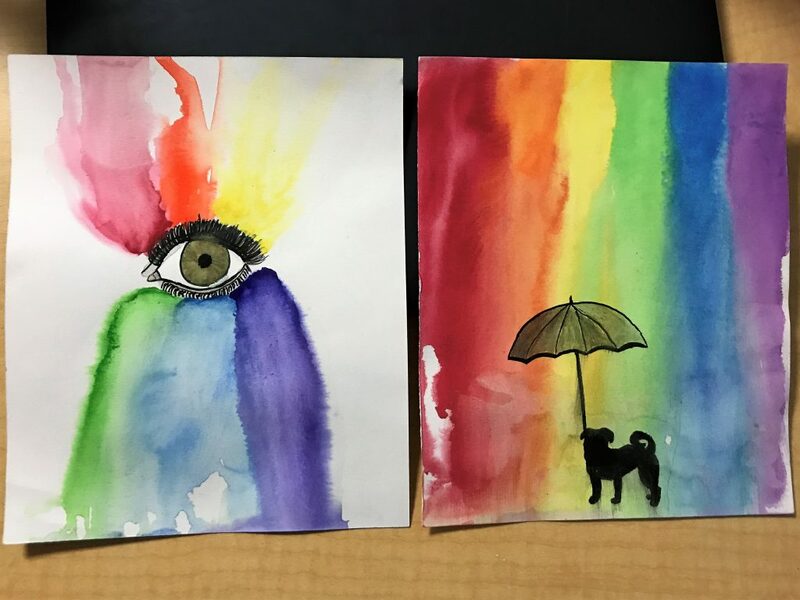 I was watercolor painting with a few clients, using rainbow colors in excitement for Pride weekend. Ironically enough, in the midst of my rainbow painting, someone started discussing his belief that any form of gender expression or sexual orientation deviating from the heteronormative gender binary should be labeled as a mental illness. Taken aback, I asked him to try and explain why he believed that. Of course in a professional environment, I can only have a composed discussion with the client. Calmly, I tried asking him to explain more in depth. He continued to say in an increasingly aggravated voice that homosexuals were mentally ill and it should be treated as such. After his reiteration, I hid the watercolors in mid-paint, feeling very uncomfortable displaying any indication of my LGBTQ+ affiliation. I had to step away for a bit to deescalate the situation. That is when recurring memories of people telling me that my homosexuality is shameful clouded my mind. I felt upset that I could not express my own side of the discussion without aggravating the client even more. 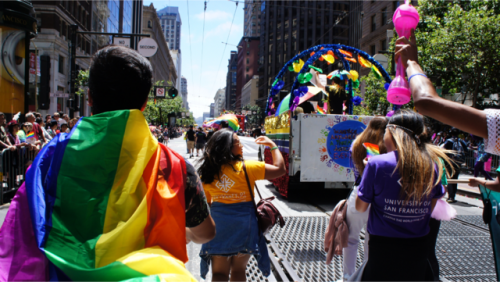 How could someone in a place like San Francisco, not to mention in an organization where 40% of the clients are queer, harbor such homophobic notions? For the first time during DukeEngage, I felt more comfortable pretending I was straight. Hearing about the increasing rates of hate crimes in the country, my heart raced wondering if I would be targeted for displaying any “gayness”. I had this vision in my head of all my friends, straight or not, accompanying me to queer events and of at least one week without the heteronormativity surrounding most social events. Not seeing this realized made me even more insecure about my identity. It wasn’t until pride came that I regained the confidence in my existence as a gay man. I had to muster up all the courage I could to showcase the rainbow suspenders I found thrift shopping. I wasn’t going to let this setback get in the way of what I was so excited for from the start. When I went to pride, I was reminded of the issues of intersectionality present in the queer community. There were countless of floats aimed to promote trans and QPOC visibility and to decentralize Pride from the all-too-common narrative of the typical white gay. 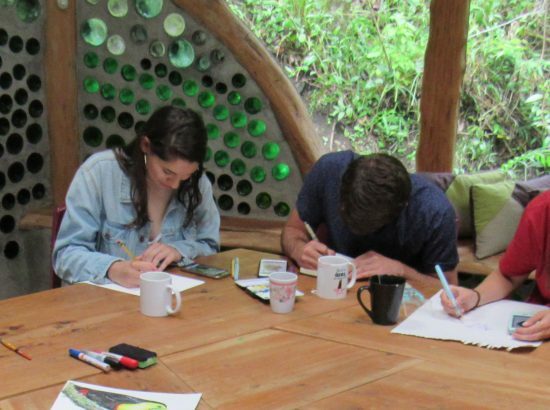 This experience lit a fire in me like no other. I did not struggle with my sexuality for the majority of my life just to let interactions such as the one at work hinder my efforts towards becoming an active member of the LGBTQ+ community. If there is one thing I learned from all this, it is to surround myself with people who love and support me. Seeing my friends cheer for me on the sidelines as I marched down in the Pride parade really inspired me to get out of my funk. I came back to work the week following Pride with a reignited passion for my own pride in my marginalized identity, greeted every person with a smile and a “happy Pride!”, and went right back to finishing my rainbow watercolors. I read this story thinking exactly what you did – how can there be a person in SF, particularly among homeless youths who can espouse such hate (and ignorance to be honest)? And then it made me sad for you that one person’s narrow view could make you feel afraid to be yourself in this city of all places. I wondered if you are told t work not to engage with people like this and to avoid confrontation . . because it seemed to me some sort of response was required (although I can certainly understand not wanting to take that on; where do you even start?). But the unpleasantness of the encounter aside, I am so glad the solidarity and the pride and celebration of Pride got you back on your game. Seems like the perfect antidote. Thank you for reading! I’m also super glad I got back in my game as well. Though it started as a rough moment, I appreciate the experience now. Having living in SF for over 20 years, primarily on a block that houses people of many races, socioeconomic segments, and even 4 lesbian couples with kids, I was shocked by your experience at work. I think I must take our city’s “culture of acceptance” for granted – and I had forgotten that homophobes and the like still exist (even in SF). I feel so fortunate to have raised two kids in a city where they (my teenagers) don’t think twice about gay marriage, transgender youth and the color of people’s skin. Not to say that they are indifferent; we have talked about the challenges faced by these groups in many parts of the world. They just see it all as acceptable, normal, and quite commonplace. When my 16 year old son was 3, he said, “Mommy, Alice has two moms.” “Yes, she does,” I replied. “I have a mom and a dad,” he countered. “Yes, you do.” I stated matter-of-factly. End of story. Your account is a wonderful reminder to keep on walking in others’ shoes and to recognize that there is clearly still work to be done in terms of making identity “prideworthy”, regardless of one’s background, sexual identity, gender or color. Thank you! Thank you as well! I think lots of us, especially as time goes on, take the “culture of acceptance” for granted because it is progressing fortunately. But as you said, there is still work to be done, and I plan to do my part!